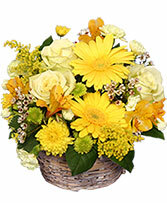 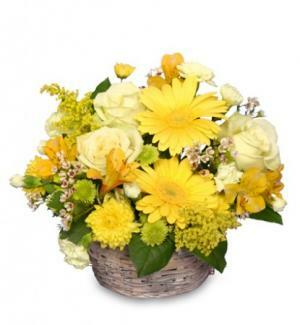 This basket of cheerful, sunny flowers is just the thing to lift their spirits and brighten their day. 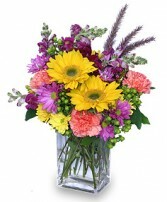 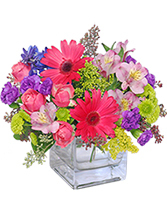 Send a bouquet of floral freshness from BUSINESS IS BLOOMING, along with your wish for a speedy recovery!! 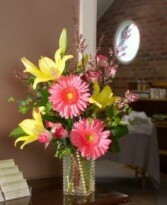 Turn someone's day around with a little floral razzle dazzle from BUSINESS IS BLOOMING! Bursting with vibrant color and style, this cube arrangement features lively hot pink gerberas, mini spray roses, pink alstroemeria, purple mini carnations and lime green button mums, accented with stems of golden solidago and seeded eucalyptus.